KIDZANIA DELHI NCR TURNS 2!! Celebrations kickstart at the global indoor theme park for families! Virtual Reality arena- Experience unique adrenaline rush with a large variety of highly advanced VR games absolutely FREE like Walk The Plank, Roller Coaster, Google Earth, Space Walk, Ocean Safari, Tilt Brush 3D painting, 3D Golf, Sailing and many more. Wohoo!! Win-A-Thon- A learning and fun packed game for the whole family where one can participate in activities like treasure hunt or a quiz and win exciting KidZania goodies. Fit-A-Thon- A perfect recipe for fitness fun where you can jump, dance, shake and swing along with your kids. Fun-A-Thon- fun-filled activities like table tennis, turn ball and much more to enjoy. Dance Academy: Learn a new dance form with the kids and show your skills on stage at the Theatre in KidZania. School of Music: Play a music instrument or become your child's Karaoke idol. Culinary School: Don the Chef's hat alongside your kids and create delicious, new dishes. Bollywood Acting Academy, Express Delivery Service , Animation Studio, Disco Lounge, Archaeological Site, The Stock Exchange and much more. Wait no more and make your day fun with new learning and experiences. 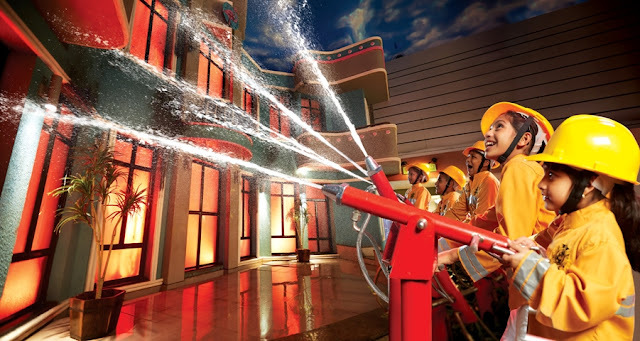 Nurture the special bond with your young ones and make your day super special at KIDZANIA.